January 2006 Online Slots News. January 30, 2006. New 5 Reel Harveys And 3 Reel Mardi Gras Slots In The Latest Microgaming Releases Of 2006. The leading online gaming software provider, Microgaming is starting 2006 with four brand new slot, blackjack and video poker games. 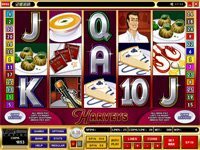 Flagship of the new releases is a full featured new video slot called Harvey's which has a food theme guaranteed to wet the gambler's appetite, and not just for winning. This brand new 5 reel, 25 payline..
January 28, 2006. Indonesian Casino Player Agus K. Shares His Online Gambling Experience At King Neptunes. Trident Casinos manager tells that there are a lot of regulars among their players. They often contact casino support just to talk. Some call to tell about their boyfriends, girlfriends, marriages, divorces, and births of grandchildren. As an established casino group with several years of successful operations, Trident casinos have..
January 24, 2006. King Neptune's And Trident Lounge Casinos Presents New Microgaming Viper Games - 2 Slots, Blackjack And Video Poker. January 20, 2006. Six New RTG Slots Games Are Released At King Solomon's And Grand Aces Casinos This Month. 6 Brand New 5 reel slots games live on the King Solomon's Casino. Geisha Lounge and Grand Aces will have all of the games on Monday. All of the new slots are 5 reel, 20 pay-line video slots with Wild and Scatter symbols, Bonus Feature and Random Jackpot, that can be won at any spin at random. See reviews of the following games: Rain..
January 15, 2006. Win Free Spins On Reel Of Fortune At Trident Casinos This Month. With Big Wheel Keep On Turnin', Great Winnings Keep on Burnin' this month at Trident Casinos. From Monday to Thursday in January, 10 lucky players will be randomly drawn each day to take a spin on Reel of Fortune. You could be one of the 180 winners this month and win one of 8 fabulous prizes: 100% Match Bonus up to $200, $50 Free..
January 13, 2006. Lucky Friday the 13th For Sue S. Who Won $50K Playing Cash Splash At All Jackpots Casino. Sue S. won $50,080.11 progressive jackpot on CashSplash slots playing at All Jackpots online casino on January 13, 2006. CashSplash is a popular 3 reel single payline slot machine game developed by Microgaming. Now players can find enhanced 5-reel 15-line version of the game connected to the shared progressive jackpot. The winner Sue S..
January 11, 2006. Win BMW Z4 Roadster At InterCasino In January Playing The Millionaires Club Progressive Slot. The Millionaires Club Progressive Slot is above the million mark again (at the time of writing: $1,122,317) and ready to make another InterCasino player a millionaire. You can also find Millionaire's Club at other Cryptologic online casinos but we would recommend playing at InterCasino or VIP casino (if you are high roller or want to..
January 3, 2006. January's Rags to Riches Competition At InterCasino - Win Your $100 Cash Prize. Play InterCasino's Rags to Riches Progressive Slot throughout January and win $100! Kimberly B. was a lucky winner when she walked away with the Rags to Riches jackpot of $118,526 on the 18th December, 2005. Next time it could be you! The 50 players who wager the most on Rags to Riches in January will each receive $100 cash prize. Prize money will be credited during the first week of February 2006. You can find the winners on the monthly winners page on the casino website.